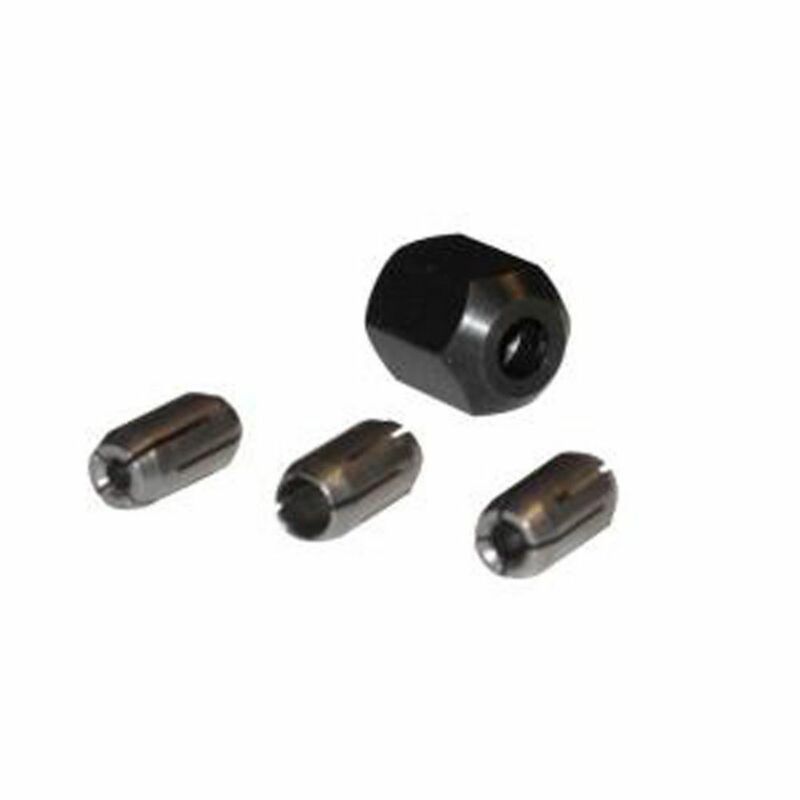 The CN1 Replacement Collet and Collet Nut kit replace the CT125, CT156, and CT250 with a single sku that includes all 3 collets and the collet nut. Keeps your RotoZip tool running at full capacity with replacement collets. Limited 1 Year. Call 1-800-334-4151 for complete warranty details and parts. An EZ Lock mandrel, EZ Lock cut-off wheels and the handy collet fan are part of this 162-piece kit filled with genuine Dremel accessories. Offering reusable storage bins and lift-out trays for easy organization of the included bits, this kit is ready for cutting, grinding, polishing, sanding, cleaning and more. The kit also includes sanding bands, sandpaper discs, polishing compound, felt polishing wheels, aluminum oxide grinding stones, silicon carbide grinding stone, mandrels, wire brush, wrench, and a reusable carrying case with clear lid. The Dremel 5-Piece Multi-Max Cutting and Variety Kit offers five cutting accessories. All accessories feature Dremel's universal quick-fit interface for quick and easy accessory changes, fitting most oscillating tools on the market. Three blades work with wood and drywall, while two are designed for wood and metal flush cutting. 175-piece kit filled with genuine Dremel accessories. Offering reusable storage bins and lift-out trays for easy organization of the included bits, this kit is ready for cutting, grinding, polishing, sanding, cleaning and more. The kit also includes sanding bands, sandpaper discs, polishing compound, felt polishing wheels, aluminum oxide Grinding Stone, silicon carbide Grinding Stone, mandrels, wire brush, wrench, and a reusable carrying case with clear lid. Collet and Nut Kit The CN1 Replacement Collet and Collet Nut kit replace the CT125, CT156, and CT250 with a single sku that includes all 3 collets and the collet nut. Keeps your RotoZip tool running at full capacity with replacement collets. Collet and Nut Kit is rated 4.2 out of 5 by 37. Rated 5 out of 5 by Tony from Now I can use other diameter bits. Now I can use other diameter bits. Rated 5 out of 5 by Ray from went together very easy!... went together very easy! Rated 5 out of 5 by K4zmb from Two sized collets & nut securely held bit. Dramatically improved... Two sized collets & nut securely held bit. Dramatically improved function of Rotozip tool when I replaced old & worn collet.